The itch-scratch cycle is familiar to everyone who knows about atopic eczema. When eczema flares up, it itches – a feeling, which leads to scratching – a behaviour. The scratching irritates the skin further, then there is more itching, and more scratching. Hence, the famous itch-scratch cycle. But with eczema, unlike with some other skin problems, not all scratching behaviour is due to itch. Especially when eczema is longstanding or chronic, scratching (including rubbing and picking) is due to habit as much as to itching. Habit scratching is something special about having atopic eczema that needs thinking about and dealing with. If not, it continues as a secret cause of chronic eczema. This is the less well-known habit-scratch cycle that causes and maintains chronic eczema despite the correct use of conventional treatment. Each of us tends to have a personal method for habit scratching that has its origins in the distant, forgotten past. 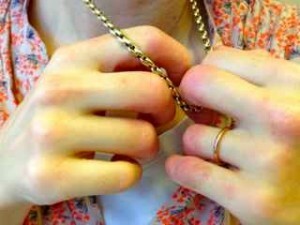 My patient in the picture above showed me how she uses her favourite necklace to rub the eczema on her fingers. How it started was not so important, but realising that it happened all the time, and was causing chronic eczema on her fingers, was very important. These special ways of scratching, rubbing and picking at the skin need adding to the usual ways of scratching, for discussion and understanding, before habit reversal can be completely successful. Otherwise healing using The Combined Approach can be incomplete – favourite areas that are targets for such habit scratching will remain, until they too can be given habit reversal protection! Do you have a favourite habit scratching method?